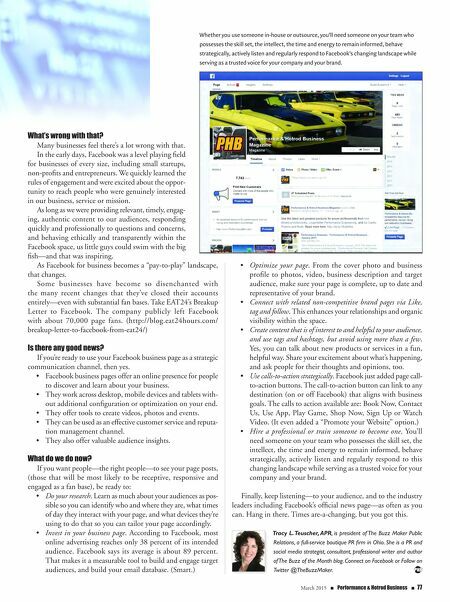 76 n Performance & Hotrod Business n March 2015 BUSINESS A s you may have already heard, read or figured out through your own Facebook use, Facebook for business has changed dramatically since 2012, including a reduction in organic page reach and engagement. Why is Facebook business page reach decreasing? I like the way TechCrunch.com sums it up in an article explain- ing filtered feed and the new algorithm that uses a primary formula of Interest x Post x Creator x Type x Recency, stating, "Facebook chose to filter its feed. It built a news feed sorting algorithm, unofficially known as EdgeRank, that analyzes every signal possible to deter- mine the relevance of each post to each person. Roughly 100,000 different indicators of importance are factored in." Translation: The algorithm decides how your Timeline feed is filtered and presented. As near as I can figure, what this also means is that every Friend, Page, Community, Game, Group, etc., that we have connected to or Liked is competing with each other for presence in the news feed. So, that narcissistic, look-at-me-all-day-long guy (we all know at least one!) is competing with everyone and everything else you're connected to via your personal page, including the business pages you like or follow. (Bummer.) How is this impacting business pages? According to an article published by Examiner.com in November, Facebook has been refining this algorithm since 2012, explaining, "Facebook executives have announced that they will be making additional changes and updates to their algorithm… Current posts by brands (are displayed) organically to (only) about 2- to 8-percent of the fan base." Translation: The new algorithm will narrow that further. So, if you want to grow and engage your business page audience or generate interest and support for your brand, product or service on Facebook, invest in an advertising campaign. Holy cow, they made some changes! So, what now? 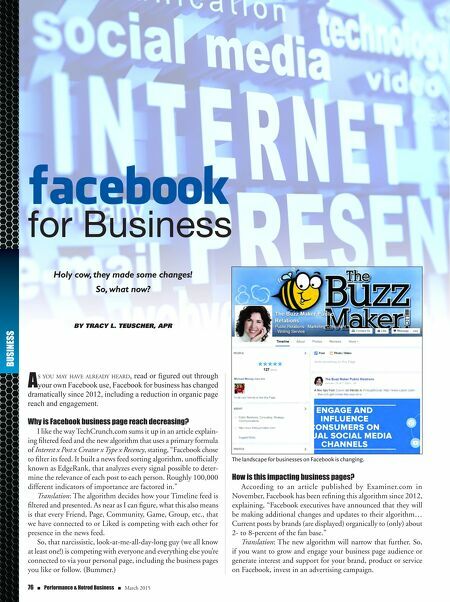 By Tracy L. Teuscher, aPr facebook for Business The landscape for businesses on Facebook is changing.